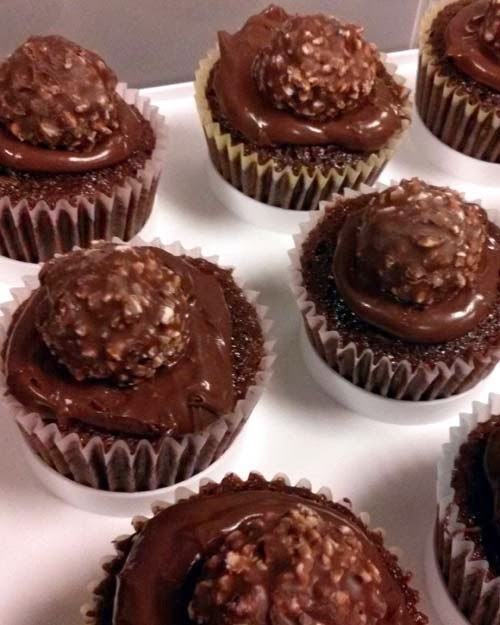 These fantastic treats can be as simple as combining Nutella, Rocher candies, and chocolate cupcakes. But in case you're in the mood to make your own cupcakes, see the recipe below. Line muffin pans with 12 paper liners. Preheat the oven to 325 degrees F.
Cream the butter and sugar in the bowl of an electric mixer fitted with the paddle attachment until light and fluffy. Add the eggs, 1 at a time. Mix in the chocolate syrup and vanilla. Add the flour and mix until just combined. Don't overbeat, or the cupcakes will be tough. Scoop the batter into the muffin cups and bake for 30 minutes, or until just set in the middle. Don't overbake! Let the cupcakes cool thoroughly in the pan. Cut out a small piece out of the top of the cooled cupcake using a small paring knife. Discard or eat the small pieces of cake that are removed from the cupcakes. This will create a well for the Nutella to sit in. Fill each cupcake with 1 tablespoon of Nutella. Repeat until the Nutella has been evenly divided amongst the cupcakes. 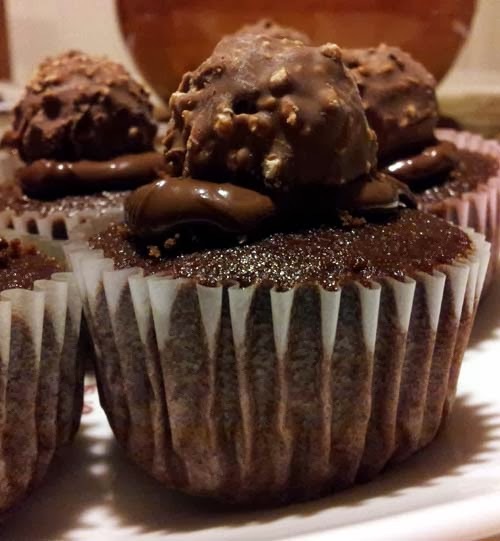 Top off each cupcake with a Ferrero Rocher candy, slighting pressing into the Nutella so it stays put.